If there is a credible rumor that the Fed is planning to further extend its “Quantitative Easing”, how would you expect the monetary metals to react? Typically, the gold price would rise and the silver price would rise even more. The question is why. Traders read the headlines and they know how the price “should” react to such news, and they begin buying. For a while, the prophecy fulfills itself. But then what happens next? It may take an hour or a month, but sooner or later some of the new buyers begin to sell. What can be bought on speculation using leverage must eventually be sold. On Tuesday, Fed Chairman Bernanke testified before the Senate. Sure enough, the prices of gold and silver rose sharply. The next day, the prices were back down. By Thursday the price of silver was lower than it had been prior to his announcement. On March 3, we published a video asking Is Bitcoin Money? While I appreciate many aspects of the cool technology behind it (being a software developer in a previous career), and noting that it has several features that uniquely suit it for certain markets, I concluded that it is an irredeemable currency, but not money (i.e. the most marketable commodity). I received much feedback on the video, some of it negative, though mostly thoughtful and engaging. At the time of the video, Bitcoin was trading around under $40. Since then, it rose to about $48. I was surprised to read that yesterday it fell to a low of $37. It has mostly recovered though it is now a few dollars below its high of $49. What happened? The technical term is that the “blockchain forked”. In the video, I was very careful not to criticize the digital currency on technical grounds such its cryptographic technology, peer-to-peer networking, its data formats, methods of validating transactions, or communications over Internet Protocol, etc. I wanted to keep the discussion about monetary science. There is a point that I could have made, and will now make here. If a currency is subject to Internet availability or other technological considerations, it simply is not money. It may still be useful for enabling commerce that would otherwise not be feasible—this is not an attack on Bitcoin as such. But (at least) one key characteristic of money is missing. Money must be beyond question by everyone and at all times. By nature, gold never becomes “unavailable” (though one could entrust it to an institution that suffers from unavailability of course). When its “blockchain forked”, Bitcoin’s essence was called into question. Suddenly there were possible competing claims to the same coin, possible loss of coins, and certain lack of availability of the currency at least until engineers fixed the problem. Technology aside, there is another factor that contributes to so-called “flash crashes”. If there is a wide bid-ask spread and/or the stack of bids is sparse, then it does not take much selling pressure to cause the price to collapse. For purposes of this discussion, let’s focus on the. While it is possible for the price to rise explosively, there is an important asymmetry between bid and ask: in times of extreme stress, it is always the bid that is withdrawn, never the ask. Imagine if the US Geological Survey said that there would be a massive earthquake in Los Angeles, estimated to be 15 in the Richter Scale and which would not leave anything taller than a fire hydrant standing. There would be no lack of offers to sell real estate. What would be gone would be the bids. Anyone who needed to sell would have to accept peanuts, if he could even get that. As I pen this, late Tuesday evening, I see a bid of $45.02 and an ask of $45.1377. This does not seem that bad, $0.1177 spread or about 26 basis points. But the bid looks thin to me! 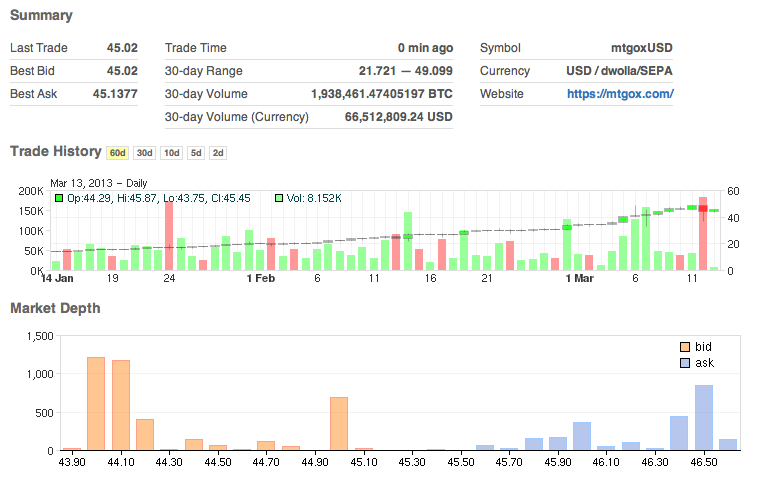 At $45.02, there is around 600 bid. This is a screen capture I just took from Bitcoincharts. There is about twice the depth a whole DOLLAR lower. And then again there is another 1200 or so bid a bit lower than that. Even assuming that there is little liquidity at 1:30am EST, this is not a picture of a highly marketable good, much less the most marketable good. One lone trader who needs to sell $100,000 worth of Bitcoin could drive the price down about 2.5%. To put this in perspective, a copper future is 25,000 pounds and copper is currently $3.55 per pound. One copper future is worth almost $90,000. I am reasonably certain that selling a copper future (or 10!) at this time of night would be but a small blip. In fact, in a few seconds, I watched the May copper future trade 25 contracts, or $2.2M. Copper is not money, of course. Bitcoin is still apparently a great trade—a speculation—as it has risen more than 12% even from when I recorded that video. Bitcoin is still useful for certain transactions particularly across borders, and especially for those people unfortunate to live in countries with censorship, capital controls, or in which some kinds of goods are prohibited. But it’s not money. It is not the good to hoard as the core of one’s savings, if one does not like the rate of interest or trust the banking system or feel comfortable about the future. The good for this purpose remains gold. This entry was posted in Uncategorized on March 13, 2013 by Keith Weiner.